Castlight’s Ecosystem allows employers to connect all their health, wellness, and benefits vendors, all in one place. Our open architecture allows integration with any third-party vendor, including Castlight Ecosystem Partners, non-Partners, and homegrown programs, allowing the Castlight platform to grow and evolve over time with employer needs. 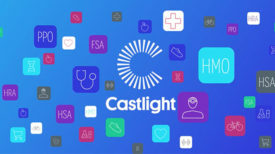 Castlight's groundbreaking research into the mismatches between employer and employee expectations for digital health. What makes Castlight’s ecosystem unique? Ecosystem Partners include a curated selection of innovative technology, ranging from solutions that help employees stay healthy, manage conditions, and access care. Our team of experts make it as easy as humanly possible to evaluate and purchase new vendors and continue to support through the lifetime of the program—from implementation to account management and reporting. Castlight’s Ecosystem makes procurement easy. You can either choose a curated package of complementary programs through our Starter Pack or Whole Person Pack, or pick Preferred Partners a la carte (yes, Castlight can help with selection). Offer a bundle of solutions that meet employees holistic health and wellbeing needs, including stress and resilience coaching and financial wellness support through the Whole Person Pack including: meQuilibrium and Enrich. Mix and match solutions based on your benefits strategy and the unique needs of your population and. Need help? Castlight offers a comprehensive workshop to support benefits leaders in building their ecosystem strategy including quantitative category and partner selection, launch cadence, and 3-year roadmap recommendations. Castlight’s Ecosystem connects employer health, wellness and benefits vendor needs, all in one place.